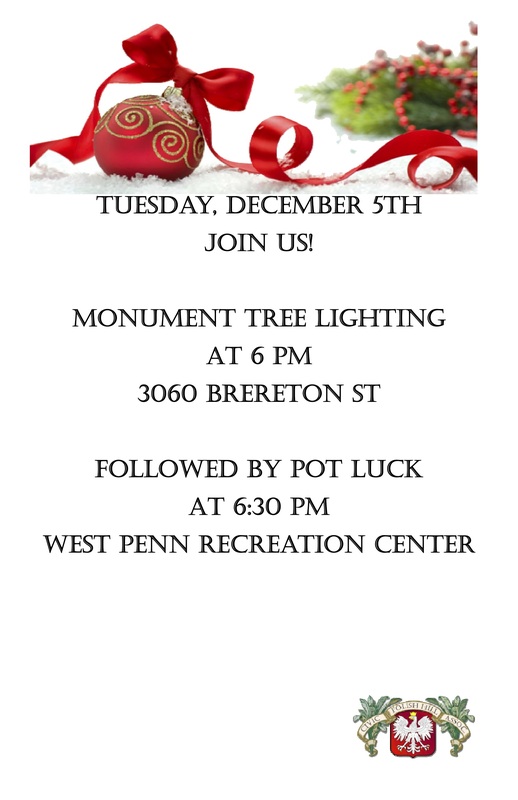 Monument Tree Lighting & Potluck! Mass mobs are bringing people into under-attended churches in Buffalo, Detroit, New York City, Rochester, Cleveland, and Philadelphia. The groups select old churches, advertise a particular date for Mass, attracting people who might not have known about the church. 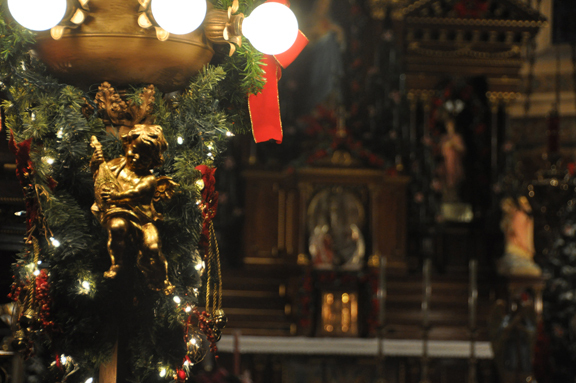 Now the idea has come to Pittsburgh, and the Pittsburgh Mass Mob will be in Polish Hill on December 28. 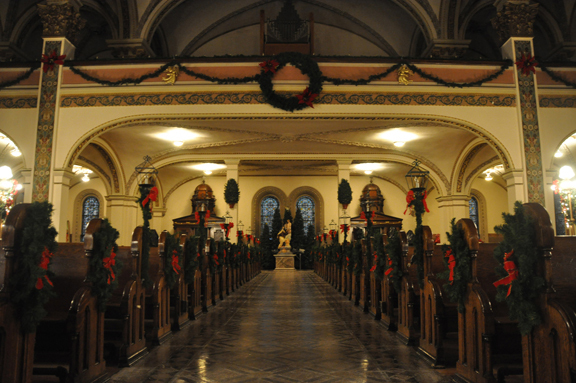 On Sunday, December 28, the Immaculate Heart of Mary Church is hosting the Pittsburgh Mass Mob at their 11:00 a.m. Mass. 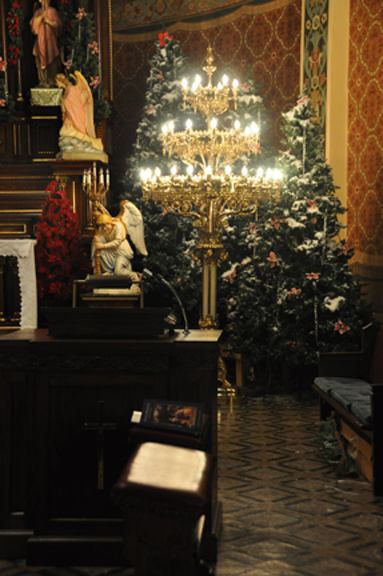 There will be a tour plus a social after Mass so that people can visit and reconnect. Elizabeth Davis of Pittsburgh Mass Mob says that they had almost 200 people show up for their last Mass Mob, and they hope to get even more people for this one. 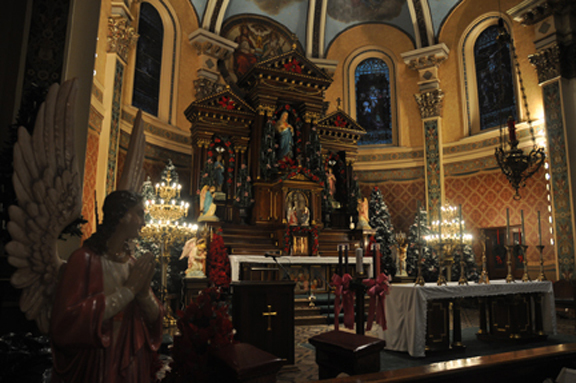 They also hope that alumni and people who have moved away will come back to celebrate this gorgeous historic Catholic Church and the neighborhood’s history. 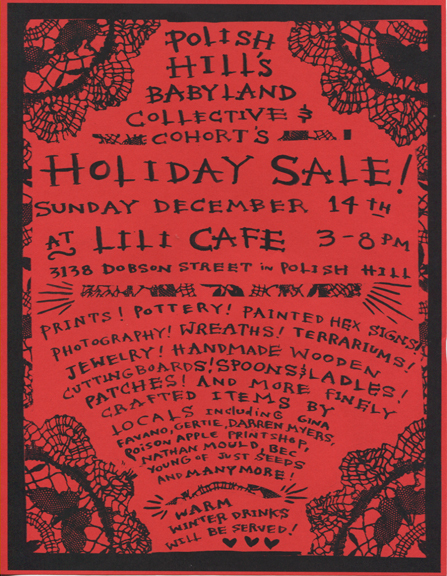 Lili Cafe will have a one day holiday craft sale on Sunday December 14 from 3 – 8 p.m. 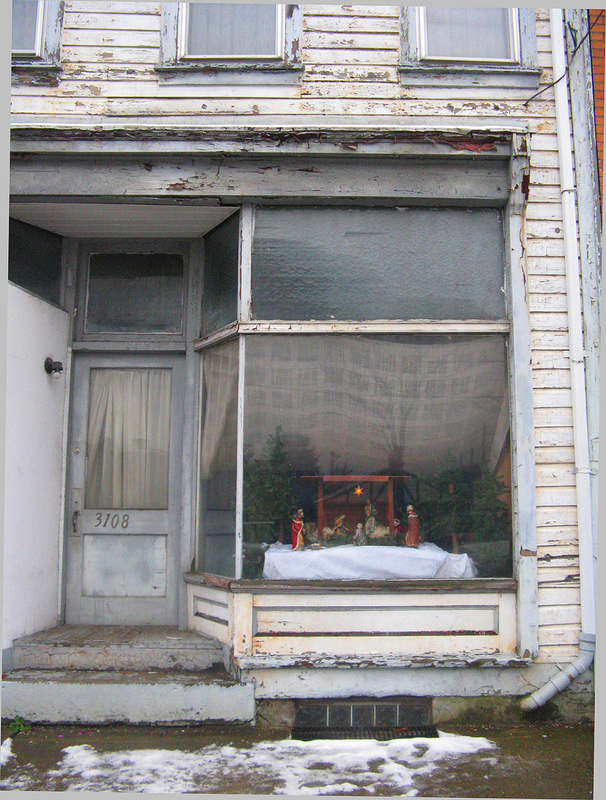 Many of the items are by Polish Hill artists and craftspeople. There are also Lili Cafe gift certificates, so you can treat a friend to good coffee and food anytime they want. Mindcure Records — upstairs from Lili, an excellent record shop with music in many genres, plus releases from the Mindcure label. Open Tue – Sat 12 – 8 and Sun 12-5. Phone: 412.621.1715. Copacetic Comics — not just comics and graphic novels, Copacetic is also a very good small bookstore with lots of good bargain priced books; also cd’s, movies, cards and more. If you’re not sure what to get, owner Bill Boichel can recommend something. He can also order anything you want. Open Mon – Fri 11-5, Sat 11-7, and Sun noon-5. Phone: 412.251.5451. 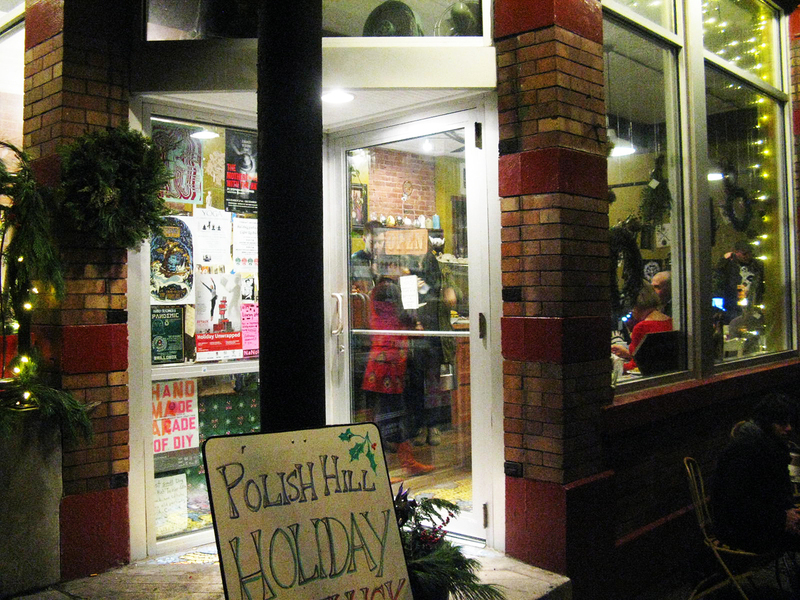 Polish Hill Civic Association — t-shirts, holiday cards, notecards, postcards, and other items with a Polish Hill theme. Items are also available in the online shore. Sales benefit the organization. Open Mon – Fri 10 – 6. Phone: 412.681.1950. 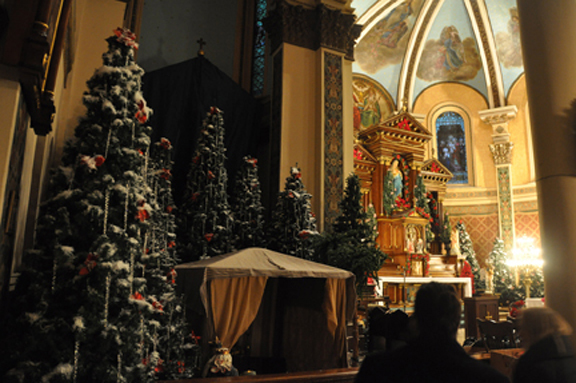 Polish Hill starts off the holiday season with three events on Tuesday, December 2. All residents are welcome to attend! 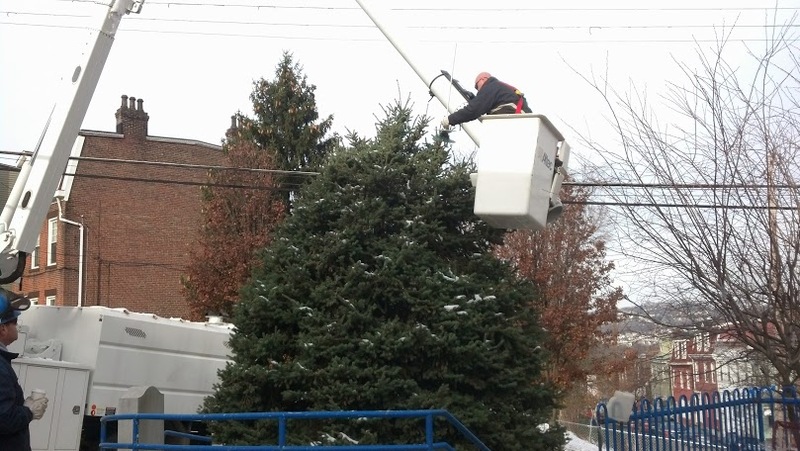 Lighting the big fir at the monument, candy canes for the kids, and maybe some caroling. A short community meeting where the votes for the PHCA board election will be counted and the winners announced. Then on to the fun: visiting with neighbors over a big spread of food from some of the best cooks in Polish Hill. Email us or call 412.681.1950 to let us know what you plan to bring. Represent Polish Hill in the Bloomfield Halloween Parade! On Thursday, October 30, we’ll be participating in the Bloomfield Halloween parade leading a group of Polish Hill residents and friends and a brass band including Lungs Face Feet and members of the May Day Marching Band. This will be the third year we’ve participated in the parade and we’d love to have you join us. Anyone is welcome. 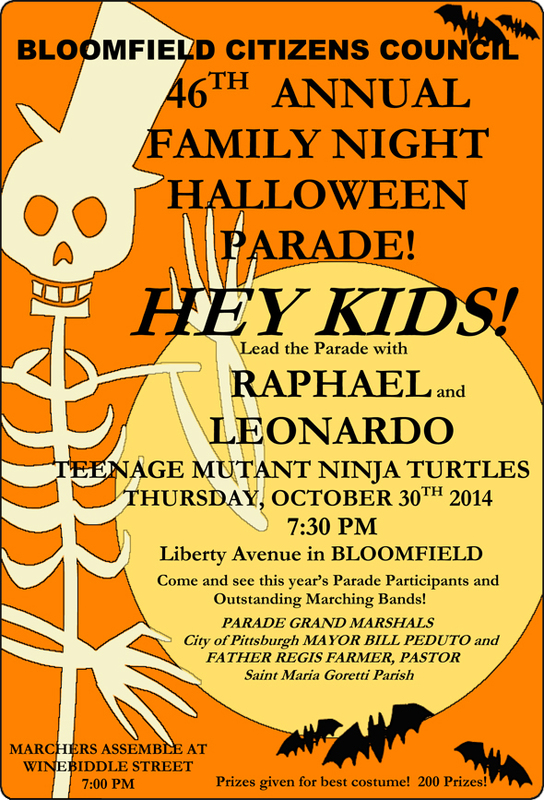 Come in costume and meet us in front of Alexander’s restaurant (5104Liberty Avenue) in Bloomfield at 7:00 p.m. The parade will begin at 7:30. For more information, call us at 412.681.1950 or email us. The lights are up around the neighborhood, and the cold and snow makes it feel very Christmas-y. The spirit of the season is expressed in many ways, from the lights on homes, to the monument tree. 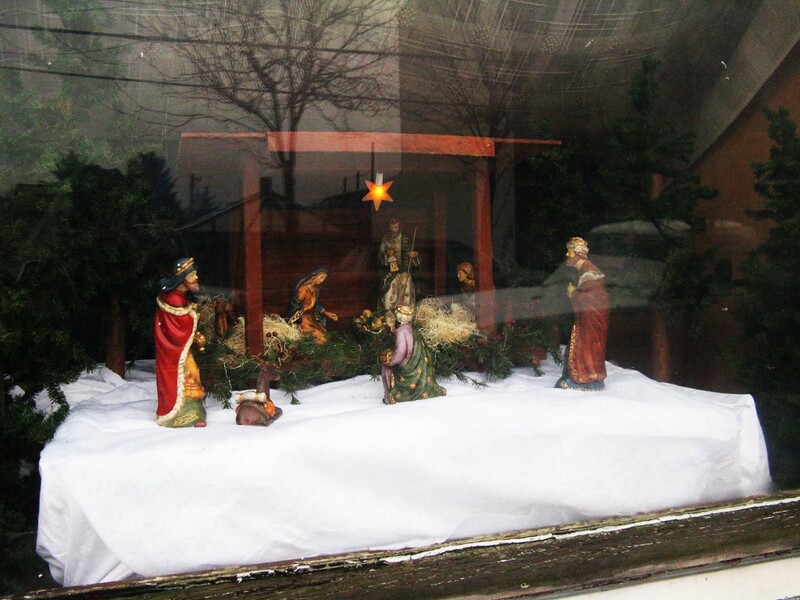 Here is a lovely small nativity scene, in an old storefront on Brereton Street. It’s a dove, by Polish Hill sculptor Tim Kaulen. 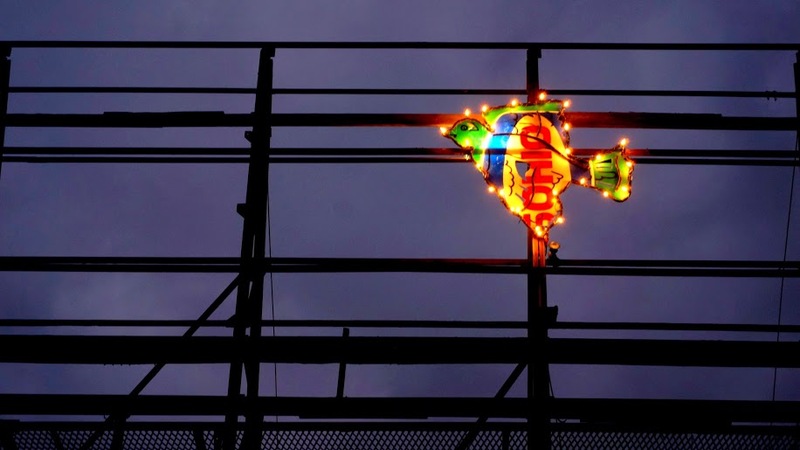 Merry Christmas, Happy Holidays, and all the best of the season to everyone! 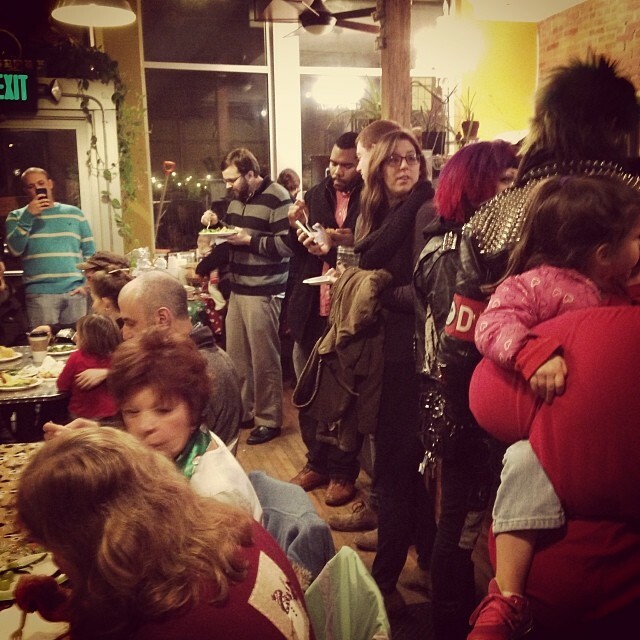 Polish Hill welcomed the holiday season with a Light Up and a Holiday Potluck Party at Lili Cafe. 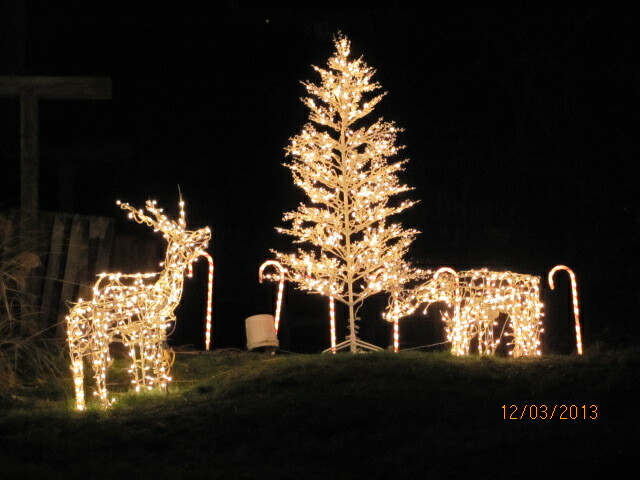 The side yard at the PHCA was also lit up. After the lights had been admired, the action moved down the block to Lili Cafe, for the potluck. There was a lot of good food, and everyone crowded in to eat and visit. 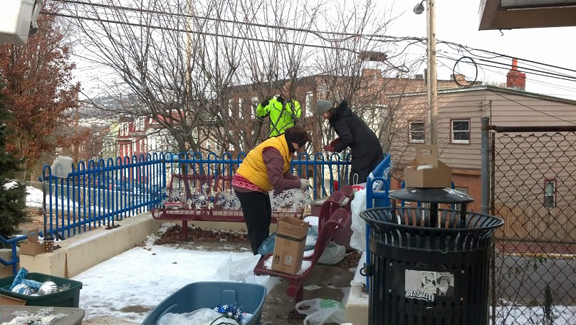 Thanks to everyone who came out, all the people who brought food, and those who helped set up and clean up. It was a great start to the season! 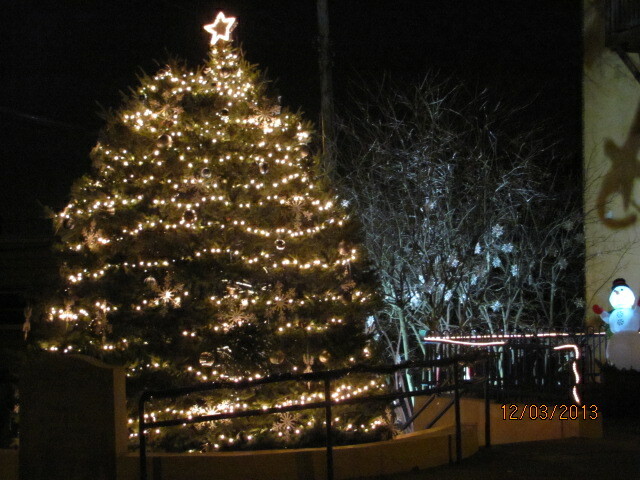 The fir tree at the monument has grown to such a size that volunteers can’t reach the top to decorate. 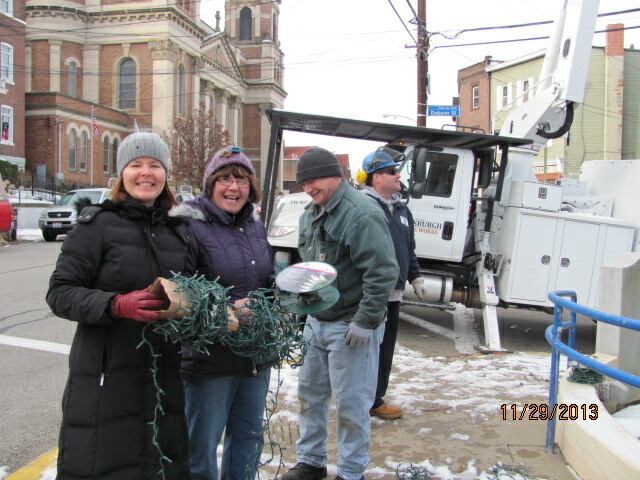 Last Saturday, the Department of Public Works kindly sent a bucket truck and crew to help out. 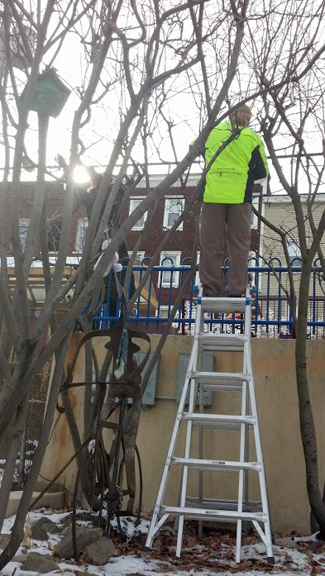 They arranged the lights on the upper half of the tree, leaving the more accessible bottom section for neighborhood volunteers. 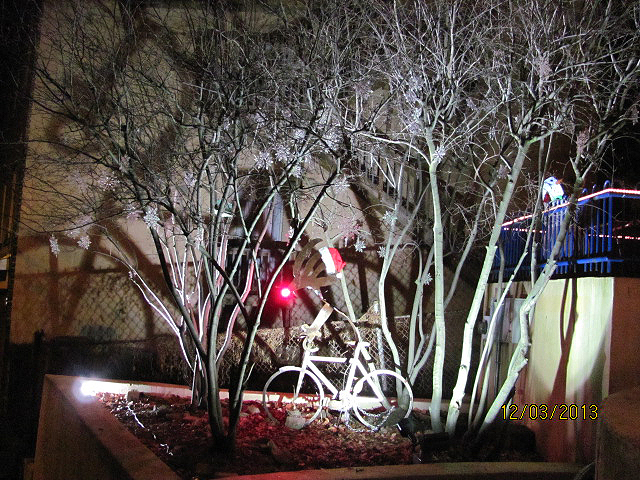 Lights and decorations were also added to the smaller trees and to the reindeer-on-a-bike sculpture that appeared last week. Everything was tested and made ready to go for Light Up night. 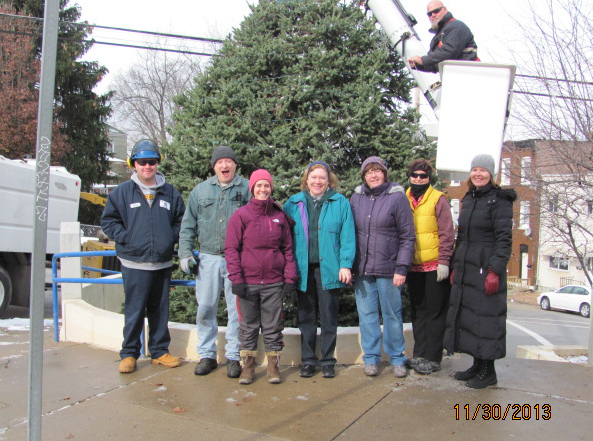 Volunteers included (left to right): DPW crew, Terry Doloughty, Alexis Miller, Janice Heagy, Deb Jozwiak, Jean Kowalecki, and Cathy Woodul. Brian Seklecki also helped out. Thanks to everyone for making the monument area so lovely, and to DPW for their help. 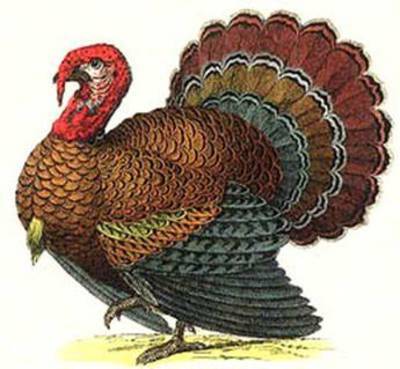 The PHCA office will be closed on November 28 and 29. 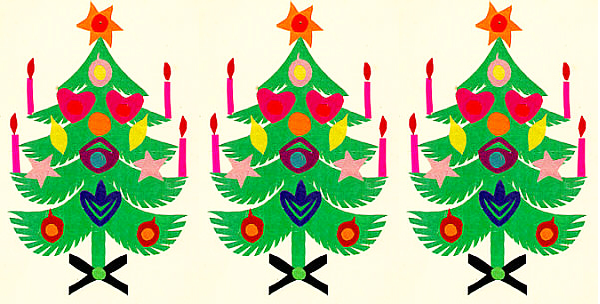 We’ll be back open as usual on Monday, December 2. If you need to get in touch, email phca@phcapgh.org, or message here — we’ll get back to you as soon as we can. Have a great holiday and a great weekend, and we’ll see you in December! 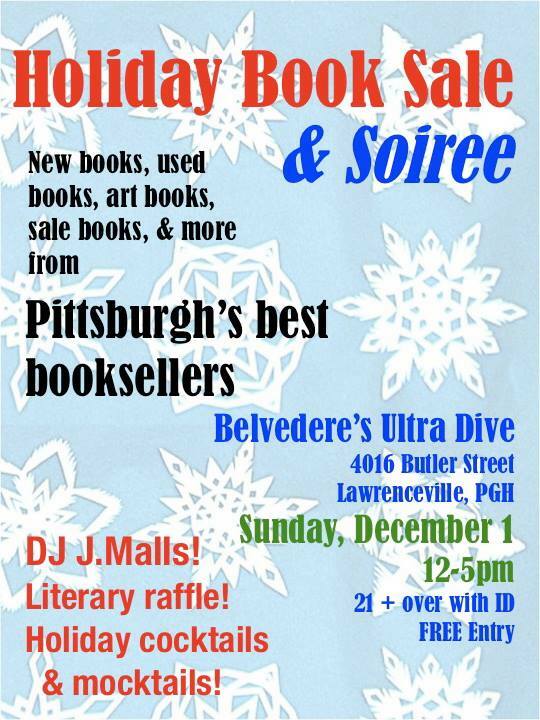 On Sunday December 1 from 12-5p.m., Pittsburgh shoppers can shop local, shop indie for the book lovers on their holiday gift list at Belvedere’s Ultra Dive Bar (4016 Butler Street in Lawrenceville). The Holiday Book Sale & Soiree will feature some of Pittsburgh’s best bookstores, selling new books, used books, art books, photography books, graphic novels, small press books, bestsellers, books on sale, local authors, holiday cards, and more. 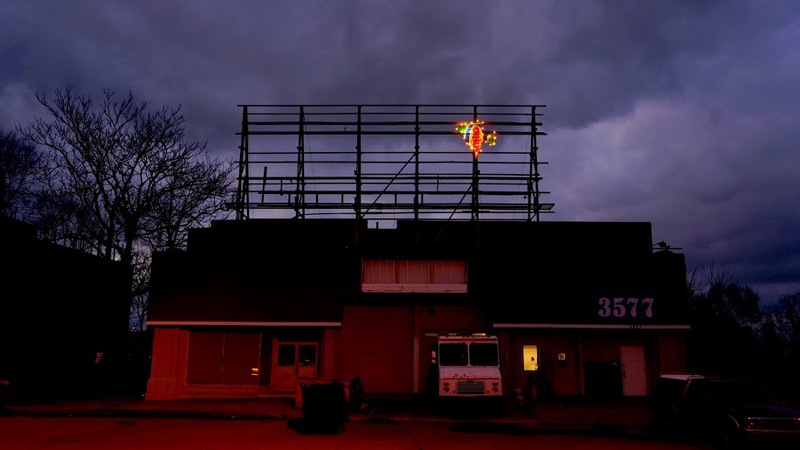 Confirmed book vendors so far: Amazing Books, Copacetic Comics, East End Book Exchange, The Muse Stand, Mystery Lovers Bookshop, Spaces Corners and Small Press Pittsburgh (hosting). In addition to the book sale, DJ J.Malls will be spinning holiday tunes, and the bar will be serving holiday cocktails & mocktails. Free entry (21 + over with valid ID). Email Karen Lillis for more info, or check out the event on Facebook.